WASHINGTON, October 18, 2013—The Washington International Horse Show (WIHS) is pleased to welcome back Military Night, presented for the first time by The Boeing Company, on Friday Oct. 25. WIHS returns to Verizon Center in downtown Washington, D.C., on Oct. 22-27, 2013, for its 55th year of world-class equestrian competition. The Boeing Company’s sponsorship pays tribute to our military men and women, recognizes achievement among show jumping’s top competitors, and supports partnerships between WIHS and the military community. The Armed Forces Cup will be awarded to the winner of the Puissance, the international “high jump” class, sponsored by Boeing. The Puissance will headline the equestrian competition on Friday and is a crowd favorite. Plus, there will be a new 1.50m Table C Faults Converted Speed Final class presented by Sleepy P Ranch. 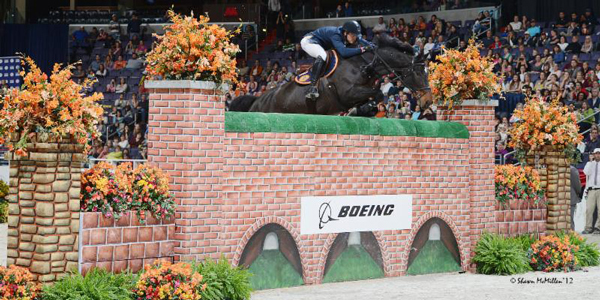 “The Washington International Horse Show is extremely pleased to welcome back The Boeing Company as a sponsor. We appreciate their ongoing partnership, which helps further our military outreach activities in a meaningful way,” Bridget Love Meehan, executive director of WIHS, said. The WIHS Armed Forces Program, which began in 2009, has grown to include a special relationship with TAPS (Tragedy Assistance Program for Survivors) as the WIHS Military Charity Partner and a popular military ticket program. This year, thanks to support from The Boeing Company, Travelers, Fidelity Investments and private donations, more than 2,500 free ticket vouchers will be distributed to area military families. Since its 1958 debut, WIHS has been a Washington, D.C. institution attended by countless horse enthusiasts of all ages, as well as presidents, first ladies, celebrities, business and military leaders. WIHS has enjoyed a close relationship with the United States military since the earliest days of the horse show when former U.S. Army horses and riders represented the United States in national and international competition. Several special exhibitions will add to the evening’s entertainment, including the return of the horses from the U.S. Army’s Caisson Platoon, 3rd Regiment, who serve at Arlington National Cemetery. New this year will be an impressive demonstration by the United States Marine Corps Silent Drill Platoon, a highly disciplined rifle unit. Through a cultural partnership with the National Museum of the Marine Corps, the Sergeant Reckless Memorial Fund and the Marine Corps Heritage Foundation, WIHS will honor an equine Marine—Staff Sergeant Reckless, a Korean War veteran, who served valiantly alongside U.S. troops. In the Acela Club, the Armed Forces Reception will feature the launch of “Healthy Stables by Design” by architect John Blackburn to benefit several local PATH International therapeutic centers (Northern Virginia Therapeutic Riding Program, Maryland Therapeutic Riding, Therapeutic Riding and Recreation Center, Loudoun Therapeutic Riding) as well as Caisson Platoon Equine Assisted Therapy Program. To find out more about the 2013 Washington International Horse Show, and to buy tickets, please visit www.wihs.org/tickets, join us on Facebook, and follow us on Twitter.